Socks. I’ve always had my favorites, the ones that stay up the best, the warmest, the best with certain shoes, the best for house lounge time, but I hadn’t thought much about how they were made until I sat down to knit a pair. Wow, that takes some time and dexterity. I fondly call the pair I made my $1,000 socks, as if at that would actually cover the time involved. Do I love them? Yes. Will I make more? Maybe. Don’t get me wrong, it was rewarding to accomplish and they are pretty darn nice, it is just a lot of dedication. The pair I made was using ONline Supersocke 100 Tropic Color, 100 gram, 75% superwash, 25% polyamid. This is a terrific yarn for this type of project. It is easy to knit, stable, washable and comes in beautiful colors. The yarn color varies so that as you knit you create stripes without switching skeins and having to tie in new colors. So really, easy in many ways. The challenge is mostly when you start out and the five double pointed needles seems to have a mind of their own. It is easy to be so focused on the two you are knitting with you don’t notice that needle three or four has slid out and dropped all its stitches. Once you get an inch or so in things do get easier and it is immensely satisfying to see the stripe pattern emerging. 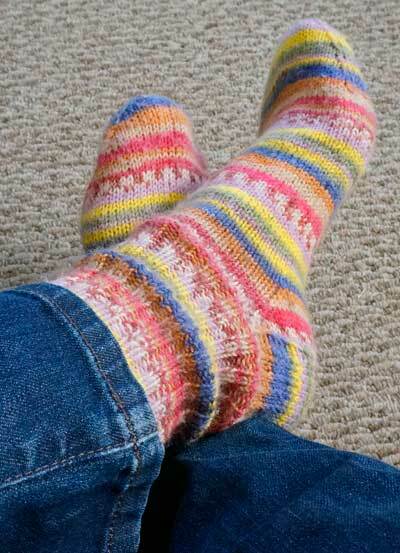 The other place of caution is as you turn the heel. You’ll want a counter, or pencil to jot down how many rounds your’ve done. I tried to do it from memory, I mean it is not that many rows, but one interruption and I lost count and ended up with a crazy warped turn that had to be taken out and redone. I was more careful and focused on the second sock.